Earlier in the month, all-time WSOP bracelet leader Phil Hellmuth was going for bracelet #12 in the 2-7 Draw Lowball Championship. Unfortunately for Hellmuth, he narrowly missed out on a chance to extend his lead after John Juanda trounced him heads-up. However, the poker gods gave Hellmuth yet another shot at glory on the final table of the Seven Card Stud Hi-Lo Championship. The star-studded final table featured the Poker Brat, John Racener, Ted Forrest, David Benyamine and Ali Eslami. But Hellmuth was able to work his way through this stellar lineup, and into a heads-up match with Eric Rodawig. Interestingly enough though, it was the unheralded Rodawig who walked away with the bracelet when everything was over with. The big story here is obviously the fact that Hellmuth finished runner-up for the second time in this WSOP. And for a guy who’s on a four-year bracelet drought, this isn’t good news. On the other hand, it’s not like he had a chip advantage going into the heads-up match since Rodawig led nearly 3-1. 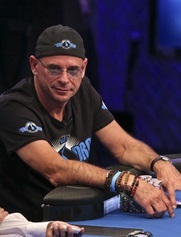 Plus the Poker Brat is leading the WSOP Player of the Year standings, which is encouraging. Before we make this whole post about Hellmuth, the bracelet win is huge for Eric Rodawig, who has just three live tournament cashes in his career. Before winning the Seven Card Stud Hi-Lo Championship, Rodawig didn’t really have any significant tournaments titles. With the big cash here, Rodawig now has $485k in career winnings.